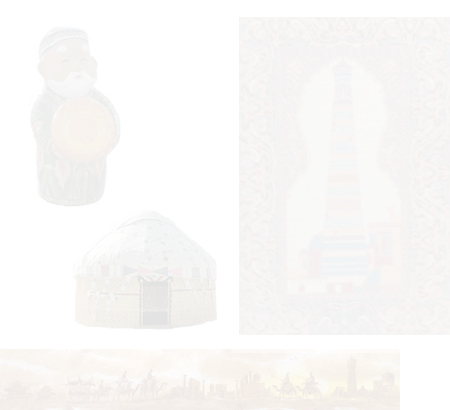 We've got an early flight to Bukhara, at 7:30 AM. 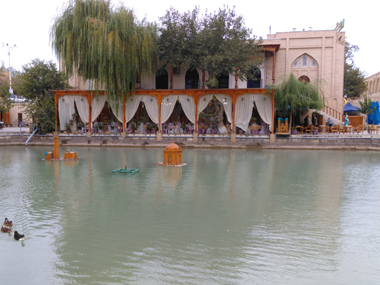 As it is just one hour and a half, we'll have the entire day to explore Bukhara. We take our breakfast and, while Eva is finishing packing, I go to the bank to exchange more euros after learning yesterday it’s the best option now. It’s a few minutes to 11 AM when we leave the hotel to the road to use a bus to airport 3 as we learned yesterday by 1200 soms each. In the airport, a water bottle in the vending machine is 1500 soms. I insert a 5000 soms note and find out I’m not going to get any change, so I get another bottle and the only snack available by 2000 soms, which was looking like some pills but was surprisingly cheese. The name of this product is Kurt. Everything goes smoothly: we make the check in and wait for the boarding gate to open for the only flight here at this time. In one hour and a half we’re in Bukhara, where we take a taxi to the hotel by 30000 soms. Hotel Khurjin is charming: it’s sited in an 18th century historic building with two picturesque courtyards. The room is full of details too. We leave the hotel quick as we want to look a place for our lunch. We choose Restaurant Tamir’s, which have only a roofed terrace for customers. It’s like they’re not used to this cold that came suddenly today, but they bring some blankets they have for these occasions. We pay 146000 soms by two soups of long noodles with meat and one fried chicken portion. We think it’s expensive based on this country standards. Then we explore Lyabi Hauz Square, which is the nearest highlight and the center of the live on this Old City. We get into Nadir Divanbegi madrasah and admire Nadir Divanbegi khanaka and Kulkedash madrasah, which are the three monuments around the square. We get too into some of the shops in this area, like a sort of local clothes outlet and a puppet workshop. We go on with our walk by the main street which makes us go through Taki Telpak Bazaar, where we purchase a beautiful hand painted miniature by 20 euros. 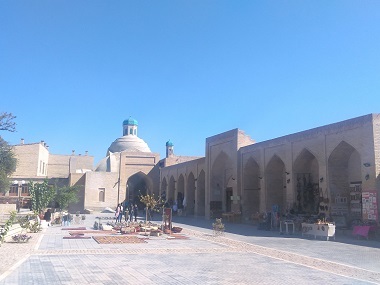 There are three buildings in Old Bukhara considered as bazaars, but streets themselves are full of stalls with mostly the same items than in the bazaars. So, there is no difference. We take some rest in the hotel and leave by night for a walk. We want to see Poi Kalon on lights but, when we get there, is all dark. The only place with lights and live at 8 PM is the one we already know: Lyabi Hauz Square.